Despite putting in an incredible performance in last weekend’s final of Britain’s Got Talent, Tina and her amazing dancing dog Chandi were beaten by the eventual winners of the competition, acrobat act Spelbound (oddly spelt with one ‘l’). Chandi, a rescue dog believed to have Australian sheepdog / border collie in her genes (as some people have been asking Dream Dogs ‘what breed of dog is Chandi’) performed another dance routine with her owner Tina Humphrey. Chandi danced along with Tina, who wore all white and sported a white cane that Chandi held onto with both paws. They danced together to the tune of ‘Let’s Face The Music and Dance’. The highlight of the routine saw Chandi tear off the bottom part of Tina’s trouser leg on cue, and then put her paws on a chair and bury her head in them. Despite such a great routine, Tina and Chandi came in for some very unfair comments from Simon Cowell, who despite loving them in the semi-final suggested that Chandi looked tire. He commented that Chandi looked like she’d had enough and just wanted to retire to her bone. Tina retorted however that there was plenty of life left in the old dog yet, and Chandi looked like she enjoyed every minute of it. Chandi is not an #Australian Shepherd cross Border Collie’. Not impressed with your inaccurate reporting. Chandi is a rescue dog of indeterminable breed, but it is generally understood that she has some Border Collie / Australian sheepdog in her genes. Unfortunately, nobody other than the unnamed original breeder could say for definite. 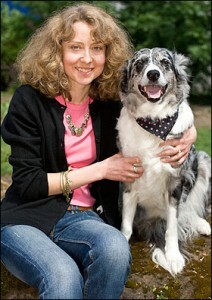 Just had to say something here – Chandi is a Border Collie! She may be a rescue dog, but I happen to know that she is a pure bred Border Collie – she looks like one too. You did make me giggle, Lianne, with your comments!